I have not baked for a long while now and was in the mood to do so after coming home from work. I wanted to make something that was quick and didn't take too long in the kitchen. Something which didn't require creaming and one of the recipes which fall into this category would have been a brownie. However I wanted something different, not the usual chocolate brownie and decided to try my hand at a cheesecake brownie. I love the swirl look of this dessert, coupled with the fact that it is intensely chocolatey, not forgetting you have the cheese element thrown in as well. This recipe comes from "Ready for Dessert" by David Lebowitz, one of my recent acquisitions to my baking library books. You can serve this brownie with a scoop of vanilla ice-cream or just eat it on its own. Great with a cuppa coffee that's for sure! As usual my office colleagues benefited from my baking evening and they gave the thumbs up for this brownie. Adapted from "Ready for Dessert by David Lebowitz"
1) Line a 9-inch (23cm) or 8-inch (20cm), for a higher brownie square pan with foil, making sure it goes up all four sides. Use two sheets if necessary. Mist with non-stick spray or grease lightly. 2) Preheat oven to 350 degrees (180C). 3) In a medium saucepan, melt the butter and chocolate over low heat, stirring until smooth. Remove from heat and beat in the sugar, then the eggs. 4) Mix in the flour, cocoa powder and salt, then the vanilla and pecans. Spread evenly in the prepared pan. 5) In a separate bowl, beat together the cream cheese, the yolk, 5 tablespoons (75g) of sugar, and vanilla until smooth. 6) Distribute the cream cheese mixture in eight dollops across the top of the brownie mixture, then take a dull knife or spatula and swirl the cream cheese mixture with the chocolate batter. Sprinkle the top with the chocolate pearls. 7) Bake for 35 to 40 minutes, or until the batter in the center of the pan feels just set. 8) Let cool, then lift out the foil and peel it away. 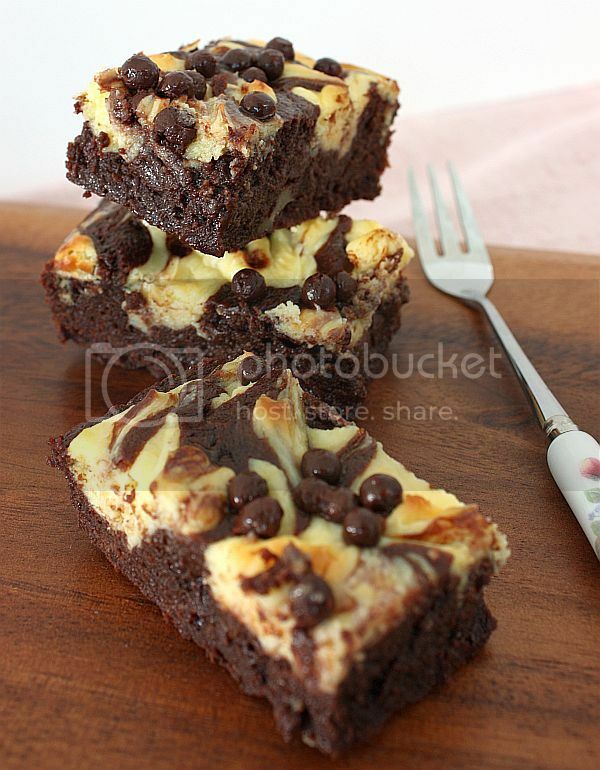 Cut the brownies into squares. Storage: These will keep in an airtight container for a couple of days. They also freeze well, too. Lovely bake! Look fudgy and cheesy! Yum! The swirls are so beautiful. I actually made these once and they were amazing. It was very hard to resist eating these little treats. I decreased the amount of sugar used because I didn't want it to be too sweet and I baked them in little squares. This looks soooo good....I need to stop thinking about the calories and find some time to make it soon ;)!! Wowow...looks so chocolately fudgely good ! 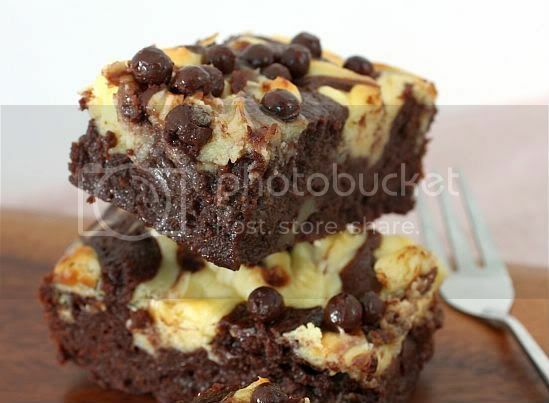 Indeed, the swirls are beautiful on the chocolate brownie. And you just combined my top favorites of cake "flavors" - chocolate and cheesecake! This looks so good! The right ratio between chocolate and cheesecake. Hi Jo, ladies like you who can bake such masterpieces under different circumstances can be dangerous to bachelors. One mouthful....he'll have dreams of the cook, ha ha. Your this cake is not only beautiful, but looks sinfully delicious! Oh my goodness, they look amazing. I've been wanting to get my hands on that cookbook and now I want it even more! Jo, to everyone's surprise, I've not made cheesecake brownies before! HAHA! I guess too much distraction around. LOL! I wish I can have a slice of your brownies now. I like the aesthetic value of its swirly looks! I made this quite recently. yours look so much more appetizing than mine. I think i'm gonna bake it in an 8 inch tin for a greater height next time and will bake mine longer too for a firmer texture. looks very tempting! I have tried DDL brownie from David before, very delicious too. These look like heaven. Perfect!!! Looks so delicious...especially the varlhona choc pearls...are those the crunchy dark choc type? Hope u can advise where i can buy them? Hi Susanna, these are just pearls, not the crunchy ones as they can't stand baking heat. If you are looking for either of them and you are staying in Singapore, you can go to Sun Lik at Seah Street. Alternatively Shermays at Chip Bee Garden also stocks them. makes it a lot of|far more|rather more|way more} pleasant on behalf of me to come back here and visit more typically. Did you lend a designer to make your theme?